Digital radio offers many advantages over analog, including improved voice quality with greater coverage, better privacy, better battery life and more. That’s why it’s critical to consider digital migration now – so when you’re ready to upgrade, you’ll choose a system with the greatest benefits for the long term. When you use a normal analog radio, every sound that’s picked up by the microphone is transmitted. If there’s a lot of background noise, it can be very difficult to understand you. Digital technology is purer. The software focuses purely on your voice, paying no attention to the machine clatter or the crowd noise around you. The result is exceptional voice clarity. When it comes to spectrum efficiency, nothing matches digital technology. Digital is so bandwidth-efficient, it can accommodate two completely separate “channels” in one 12.5 kHz channel. As well as making more efficient use of precious radio spectrum, this also minimizes your licensing costs, especially as your business grows. With digital, you can immediately double the capacity of your existing 12.5 kHz channel and enable many more people to communicate without worrying about privacy or interference. Digital radios have built-in error correction to eliminate static and make sure voice calls are heard clearly over a greater range. There’s no interference, background noise or distortion. Digital maintains voice integrity to the very ends of the coverage area. 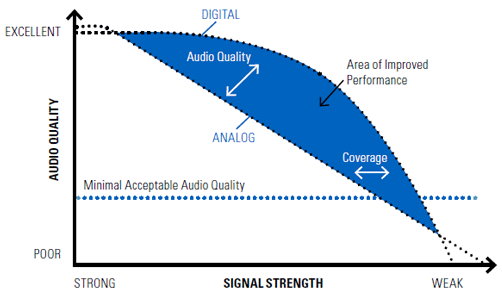 While both analog and digital radios consume about the same power in standby mode, once you start transmitting, digital radios are dramatically more efficient. This is critical for frequent and heavy users who depend on their radios to last the entire shift and can’t stop to replace batteries or recharge radios.